Need an easy dinner idea? 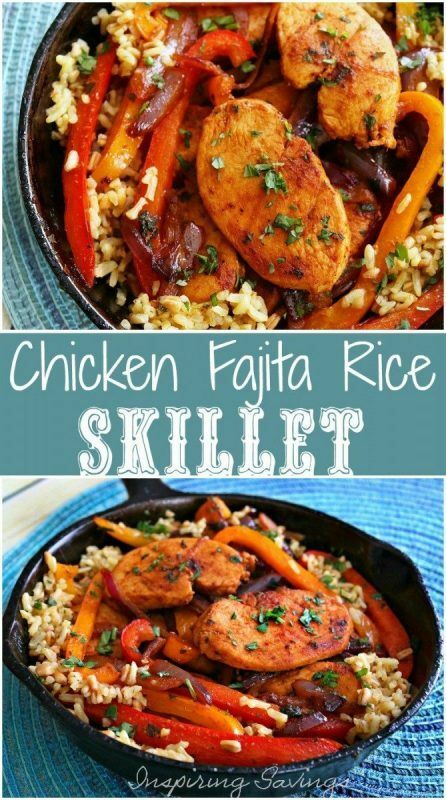 Don’t miss our Fajita Style Easy Chicken And Rice Recipe! This great one-pot skillet meal is ideal for a busy weeknight! Yellow, red and green peppers, sliced onions and chicken breasts, mixed with some simple spices Simple to customize for your family and naturally gluten-free. Who doesn’t love a quick chicken meal? What’s better than a home-cooked easy chicken and rice recipe? 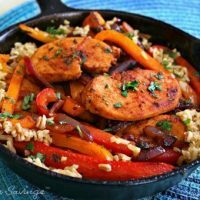 A home-cooked fajita style Easy Chicken And Rice Recipe that is also a skillet meal that requires little effort. This one-skillet chicken recipe is my go-to chicken dinner of the week decade. How awesome is it to have an entire meal made in one pan? Make meal planning for this coming week a lot easier with this easy chicken and rice recipe. Plus, a huge bonus is only one pan to clean up! That makes it so much nicer for me since I do most of the cooking and have limited time for relaxation at night. This hearty recipe needs just a few ingredients and is ready in 30 minutes flat. I am talking tender chicken, pepper and rice all rolled into one meal. Throw in some freshly squeezed lime juice…. DROOL! Should I just stop here? Are you on your way to the kitchen, because you should be! The great spice means everyone loves this dish, and it definitely takes it a step above the classic cream soup based chicken and rice recipes of our childhoods. To begin this easy chicken and rice recipe, you’ll want to get those chicken breasts browned on both sides. You don’t have to worry about cooking the chicken all the way through. We’re just looking to get some color on the chicken and add in those wonderful flavors from the bottom of the pan. Make sure that your chicken is sliced with even thickness. Making sure they are being cooked about the same time. This guarantees you won’t have some pieces that are underdone or some that are overdone. Knife skills are important for even cooking. Once you add your peppers and have them mostly tender, you’ll add in your rice and water. This will simmer until the rice is cooked through. Mix everything together in this easy chicken and rice recipe to create a hearty meal that serves the whole family out of one dish! If you like your fajita flavors a bit spicer you can add in some sliced jalapenos or a bit more chili powder to the seasoning mix. I prefer a bit milder for kids to enjoy, but you can definitely customize this recipe to suit your flavor preferences. 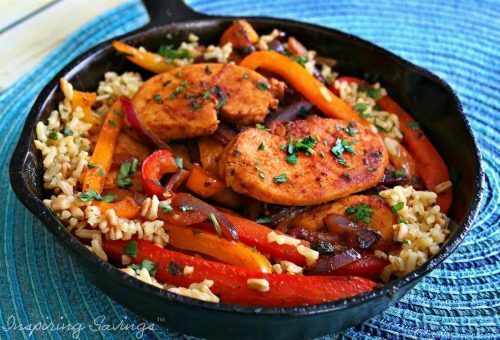 One skillet chicken dinners, conquering the kitchen and making a quick meal is what this mama is talking about. Dinner just got HACKED!!! Serve this easy chicken and rice recipe with some fresh pico de gallo, salsa, or go a step further and toast tortillas to create a burrito with sour cream, guacamole, and shredded cheese! Add peppers, onion, garlic, seasonings and a squeeze of lime. Mix, saute an additional 5 minutes. Add the water and rice, stir. Place in the oven covered with aluminum foil for 20 minutes or until rice is tender. Top with chopped parsley, cilantro and a squeeze of lime. Want a great iron skillet? You can get one through Amazon. I own this same one and use it often. I know you will enjoy it too. Have you tried this with smoked paprika? Looks like a dish that would be great for it.